The ocelot is on the brink of U.S. extinction. “Only two populations of ocelot are left in the U.S. that we know of,” biologist Jody Mays of the Rio Grande Valley’s Laguna ­Atascosa National Wildlife Refuge reports. “Both are extremely small and at high risk of extinction.” One population resides at the refuge, the other on private property farther north. The ocelot (Leopardus pardalis), a midsized wild cat covered in spots and streaks, once roamed the southern states of America, including Arkansas, Louisiana, Texas and Arizona. From here, their historic range extended into South America. But over the last century, the U.S. population has been dramatically reduced, and now the cats, along with their natural habitat, have reached a tipping point. After 25 years of ocelot field research, biologists can confirm for certain only a small number of known ocelots surviving in America today. Past estimates were based on the amount of available habitat, confirmed kills and ­sightings and trapper surveys. Decades-old estimates suggested at the time that only 80 to 120 cats remained in the wilds of the United States. Today, when known ocelots are totaled from the remaining two populations in the Valley, verified by trapped cats in-hand and those photographed by wildlife trip cameras, the current confirmed count of ocelots in the country stands at less than a few dozen. This grim reality is not new. 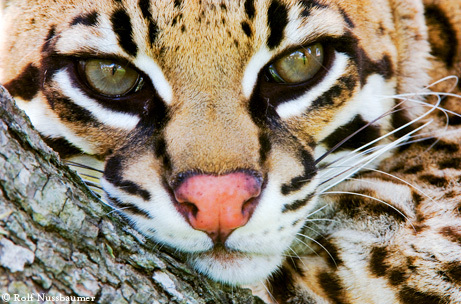 The ocelot was designated an endangered species almost three decades ago. Its federal status afforded U.S. protection throughout the cat’s historic range. But the ocelot is one of many species on the losing end of a battle with urban expansion, habitat destruction and vehicular mortality. Unfettered development and the human population explosion throughout the Rio Grande Valley have guaranteed the ocelot’s decline, not only by eliminating the native South Texas chaparral it requires to survive, but also by dividing what remains of it into fragmented pieces. Worse yet, the roadway that often splits habitat in two has frequently become the ocelot’s last destination. Forty percent of the population’s mortality is attributable to vehicular deaths. First hunted to near extinction and then deprived of its habitat, our final ocelot population is now being reduced to road kill. But Mays, with a smile that belies a deliberate resolve, believes there is still hope for the cat, a creature peppered with a beautiful pattern of dots and dashes that has inspired fashion — and helped spell the cat’s decline — since the time of the Aztecs. Mays has a reason for both urgency and optimism. In December 2008, one of the refuge’s wildlife trip cameras caught an image of a female ocelot with her 6-month-old male kitten. It was the youngest ocelot documented on the refuge in almost 10 years, and the first image to capture both mother and kitten together. The photograph confirmed the biologist’s hope that ocelots are reproducing on the refuge. Since then, the ocelot kitten has been trapped, tagged with an electronic identification device, tested for diseases, vaccinated and radio-collared. Ocelots, adorable as kittens before maturing into sleek, stunning adults, showcase all the features that have helped draw attention to other endangered, charismatic species such as wolves and tigers, yet these advantages have had few positive results for this wild cat. Historically, the ocelot’s survival in the United States has been undermined by both the pet and fur trades. However, our misguided engagement with the cat has endured over the centuries for a reason — the ocelot is, undeniably, an enchanted being. The ocelot has shadowed our own struggle for survival since humans arrived on the western continents. Its original range, from Texas to Argentina, guaranteed its presence in New World mythology. 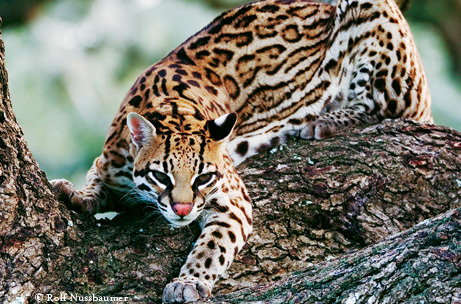 The name ocelot is derived from the Nahuatl word ocelotl, meaning jaguar. Nahuatl, the Mesoamerican language believed to have been spoken since the first decades A.D., was also the language of the Aztecs, who called the ocelot tlalocelot, meaning field tiger. The Aztecs practiced a ritualized animism in which the ocelot, serving as an avatar, no doubt played a part. Its claws, meat, pelt and blood served as ritual components as well, a practice documented in Central America as late as the 1950s. Twentieth-century ocelot hunters were known to eat the meat, claiming it imparted strength and health. They also drank the dead ocelot’s warm blood as it accumulated in the thorax. Unfortunately, these kinds of supernatural beliefs continue to prevail in many parts of the world, to the detriment of ocelots and other wildlife. But it has been the material desire for the ocelot’s exquisite fur that has dramatically accelerated the wild cat’s downfall. The modern age has seen hundreds of thousands of ocelot pelts incorporated into coats, hats and purses. This ocelot fur trade became illegal in the U.S. after the ocelot acquired endangered status. It is also prohibited in some of the Central and South American countries, where healthier populations of ocelots survive. But in some parts of this historic range, the fur trade continues. 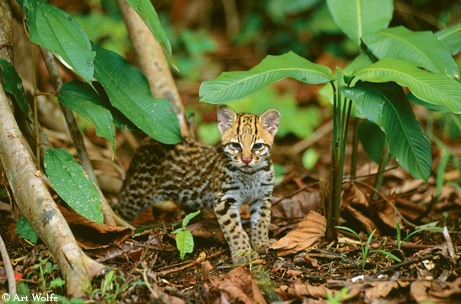 So far, ocelot populations beyond our southern ­border have fared better than those in America. But getting a population estimate throughout the cat’s southern range is difficult. Habitat fragmentation isolates wildlife, causing inbreeding and loss of genetic diversity. It also increases mortality rates. The two populations in the Rio Grande Valley must negotiate gaps like subdivisions, urban development and major highways to access additional habitat, exposing them to potential harm. Establishing safe corridors between areas of natural habitat by factoring wildlife corridor construction costs into the budgeting process for highways would make a difference. “We’ve identified some areas where wildlife crossings beneath roads need to be placed,” Mays reveals, “and are working with Texas Department of Transportation to try and get some of those crossings built.” An additional solution is to restore or conserve natural habitat along the Valley’s many irrigation canals and drainage ditches. But the most successful weapon in the battle to save the U.S. ocelot population is simple — halt the rapid decline of existing natural habitat. Loss of habitat spells the decline for healthy species as much as it does for endangered and threatened wildlife. The ocelot’s thorn scrub and the surrounding coastal plains are home to a variety of Texas natives, including roseate spoonbills, alligators, hawks, pelicans and countless migratory waterfowl and songbirds. Lose the habitat and the wildlife that depends on it will vanish as well. Mays and other biologists believe that one of the best ways to preserve existing habitat is by partnering with private property owners who may have native habitat present on their lands. Less than 5 percent of the original Tamaulipan thorn scrub that once covered the state’s southern region remains, and much of it is in private hands. “There’s a big misconception out there that finding an endangered species on your private property means your property will be taken away or you will be told exactly what you can or can’t do with your property, and that’s just not true,” says Mays. A winning situation is needed for the South Texas ocelot, an animal nicknamed “the ghost cat” because of its secretive, nocturnal nature. But unless Texans are willing to reverse the decline in the ocelot’s population, soon the name will also become its epitaph.